The Axiom range comes of age. Check out all the options to find the model that suits you. HyperControl DAW integration improved. MIDI/HyperControl switching really flexible. Neat drum pad programming options. An original Axiom Pro has been this reviewer's controller weapon of choice for a few years now. We'll be honest, though: we're barely scratching the surface of its capabilities most days. 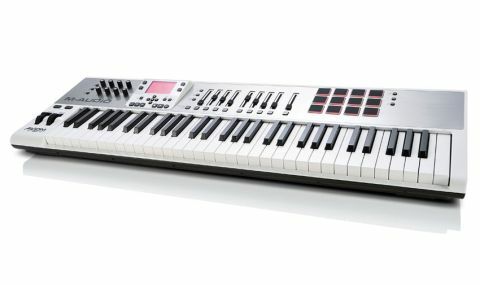 We like its keyboard action and it's useful for bashing out drum patterns and tweaking MIDI CC values on the fly, but while it offers M-Audio's HyperControl functionality, we've never quite clicked with it. In part, this is because it's a little awkward to set up, but it has more to do with the fact that when in HyperControl mode, it isn't easy to simply control MIDI CCs. Equally, when in CC mode, it would be great to be able to control DAW parameters which aren't assignable over MIDI alone. One of the cornerstones of the new Axiom Air range is increased flexibility to address this very issue, so we're interested to take a closer look. Before we get into explanations of the control options, let's check out what else is on offer. The Axiom Air 61 is a deeper (front to back) beast than its predecessor and now sports a white and brushed-aluminium face-plate, the back half of which is where the action lies. "The orange backlit screen is titled forward to facilitate easier reading - an improvement over the 'flat' screen on the Axiom Pro"
From left to right, you'll find eight lit rotary dials before you reach the orange backlit screen, which is titled forward to facilitate easier reading. This is a marked improvement over the blue backlit, 'flat' screen on the Axiom Pro. To the right of the screen, nine 70mm faders lie in wait, each with their own backlit buttons below. Further to the right, the Axiom Pro's eight drum pads have been augmented to 12 and these are backlit now, too. The bottom left-hand corner provides the expected Pitch Bend and Mod wheels, while Octave -/+ buttons feature lights that use a traffic light system of green, amber and red to show how far north or south of the default you are, where the bottom key is C1. Round the back, you'll find standard MIDI In/Out ports as well as a USB port that provides both MIDI messaging and buss power. Lastly, there are ports for Sustain and Expression pedals, as well as a 9V DC port for mains power. The keyboard's playing surface has improved too - it's a more responsive and firmer touch than the original Axiom Pro and it responds to velocity and aftertouch without you having to bash or squeeze too hard. You can also customise velocity curves to suit your playing style, if you wish. "Everything works beautifully and in a much more streamlined way than we've experienced with the Axiom Pro"
However, with such a raft of tactile options before you, the keyboard is only one way in which you can make your hands busy. So, how does the Axiom Air 61 respond as a control surface? Well, once we've downloaded a firmware update and the driver for our chosen DAW and set the Air up as a control surface, everything works beautifully and in a much more streamlined way than we've experienced with the Axiom Pro. This is largely because M-Audio have added MIDI and HyperControl toggle switches in different sections of the Control panel. What this means is that if you want to use the sliders for HyperControl of your Mix Faders, you can, whilst at the same time using the rotary dials to control MIDI CC's, rather than the Pan control they automatically offer in HyperControl mode. It gets better, though... It's possible to assign both HyperControl and MIDI functions to the rotaries and the sliders, so that, at the press of a button, you can control either data type from the same faders. And we're still not done... There are dedicated HyperControl buttons for both Mix and Inst/FX for the faders and the rotaries and each of these provides control over three layers of assignments. This means you can access well over 50 parameters from either the fader bank or the rotary controls, comprehensively enabling you to drive a session from the Axiom Air itself. "Customisable rolls for the on-board drum pads bring real power to pattern programming on the fly"
Of course, particularly if you want to work with MIDI control extensively, you'll be looking to assign particular control numbers to specific dials and sliders and this is carried out via the Edit menu. This takes a little getting used to, but M-Audio has made things as simple as possible; there are labelled functions on the bottom octave of the keyboard, enabling you to learn assignments automatically, or scroll them in by hand. There are some other neat features too, including customisable rolls for the on-board drum pads, which bring real power to pattern programming on the fly. Two pieces of useful software are bundled as well; Pro Tools Express comes complete with its own iLok key, and there's Air's Ignite package, too. The Axiom concept has come a long way from the original Axiom Pro and our concerns about HyperControl and its slightly fiddly nature have been consigned to history with this release. The Axiom Air is perfectly capable of sitting in front of your computer and providing useful control through the programming, production and mixing stages of your session. With 32-, 49- and 61-key variations, you'll have to decide which model suits you best. We'd love to see M-Audio release an 88-key version, but the good news is that none of the existing models will let you down.